Remember the function served by plants and structures is more important than their appearance. In other words, don't base your planting decisions solely on what a plant looks like. 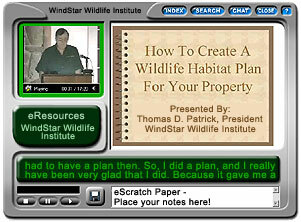 Following are WindStar Wildlife Institute's plant recommendations for wildlife habitats in New Jersey. New Jersey contains a diversity of fish and wildlife habitats from Delaware Bay coastal marshes to Kittatinny Ridge mountain tops. New Jersey is either the 4th smallest state or the 47th largest state depending on your perspective. Regardless, New Jersey is occupied by four main land regions; the Atlantic Coastal Plain, the Peidmont, the New England Upland, and the Appalachian Ridge and Valley Region. The New Jersey Native Plant Society can provide lists of plants for a specific region.